Lumidigm, Mitrefinch’s biometric partner has received praise from Benchmark Magazine, a leading monthly publication on security technology. The report in the magazine’s May 2012 issue states that biometric fingerprint readers using multispectral imaging (MSI) provide more consistent readings than those relying on optical scans only. Benchmark tested a number of fingerprint readers and discovered that optical scanning readers had trouble getting a clear, usable scan if the digit being presented wasn’t dry, clean or clear. Benchmark found that multispectral imaging (MSI) sensors provided a more robust solution. MSI sensors from authentication provider Lumidigm for instance, scored well in the Benchmark tests. Lumidigm’s MSI sensors use technology to uncover unique fingerprint characteristics from both the surface and subsurface of the skin, generating more consistent and tamper-resistant fingerprint scans than those made with other biometric technologies. According to the report, one of the biggest issues with biometrics-based fingerprint readers was that many models struggled to obtain a clear and usable scan if the digit being presented was damp, dirty or damaged because most sensors relied only on an optical scan. The report recommends using multispectral imaging (MSI) as a more robust solution. Use of the MSI technology, and the consistency with which it performed in conditions that would see other units simply fail really does set the technology apart from its peers. Lumidigm VP, Transaction Systems Bill Spence says that the review verifies for many people what they already knew from field experience. The independent testing now confirms the superior fingerprint reading capabilities of Lumidigm technology. 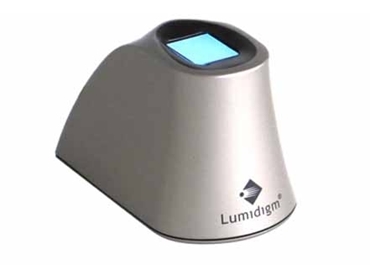 Mitrefinch Australia is proud to be associated with Lumidigm’s pioneering MSI technology, utilising their robust fingerprint sensors across all biometric time and attendance devices.